The only accidents I’ve ever had usually involve a car and several thousand dollars in auto body repairs. Guess I’m not as lucky as the makers of Innis & Gunn. Oh well! 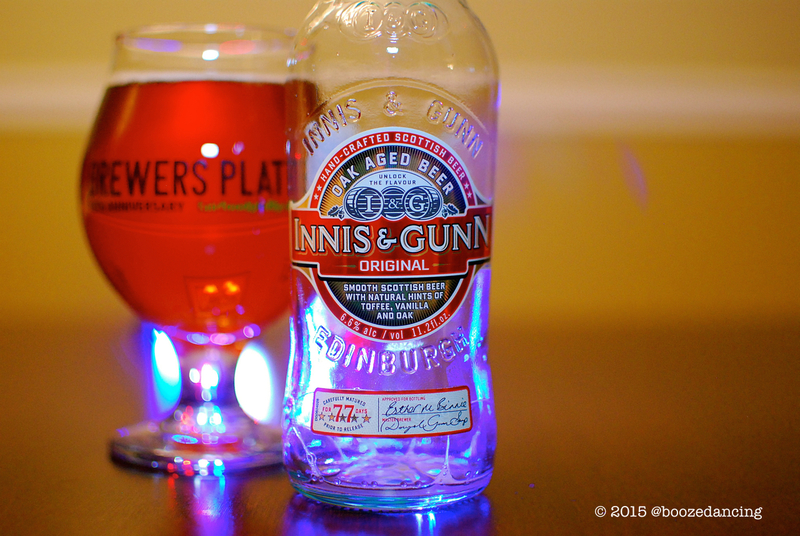 At least I occasionally get to try other people’s Happy Accidents, like the Innis & Gunn Original that you see in the photo at the top of this post. Just so you know, this is the second time that we’re reviewing this beer. Limpd tried this back in 2013 during a Jersey Week excursion to the Happiest Place on Earth. Click here to read his review, and to get a bit more background information about this brewer. Appearance: Reddish orange color (dusty copper perhaps?). Not much in the way of head or lacing. Aroma: Quite sweet on the nose with caramel, toffee, and vanilla coming through loud and clear. I detected very little hop like scents. Taste: Lightly carbonated with a medium mouthfeel. Somewhat creamy too. Very malty with all of those vanilla and caramel notes from start to finish. There aren’t many flavor transitions along the way, and there is little to no bitterness. This was probably my second or third time having the Innis and Gunn Original. Once again it has proven itself to be very smooth and easy drinking. This isn’t one of those over the top or weird beers. It’s just a solid and refreshing one that I bet would go great with a vanilla or caramel based dessert. Creme brûlée perhaps? Many thanks to Savona Communications for the sample!